Emergence is a project by UK digital art and design studio Universal Everything which explores the behaviour of individuals and crowds. A newly updated version of the project will premiere at the 2019 Sundance Film Festival presented in collaboration with WITHIN. The project is also featured in Universal Everything’s solo show Fluid Bodies at Borusan Contemporary in Istanbul. Emergence is an open world environment which explores individual and collective identity and how the two relate. Developed using cutting edge graphics technology, the project models over 5000 human behaviours digitally, resulting in a virtual crowd with complex behaviour. Through this crowd, individuals emerge, transforming in response to the bodies around them and the opportunities for power, freedom and safety that arise. The project is a reflection on human behaviour, in particular how humans act in a crowd and the conflict between the desire to develop individuality and the desire to be part of a community. It is an interactive virtual reality environment in which the visitor becomes the individual going through the transformative process of identity formation. 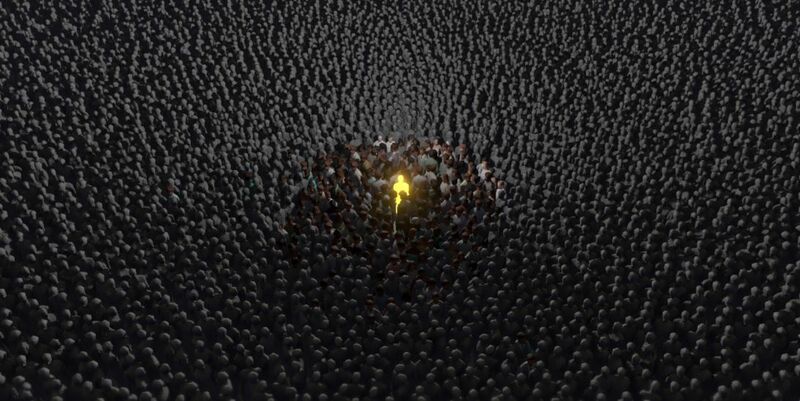 “As you immerse yourself in a crowd of thousands, shafts of light beckon you closer. As you touch the light, the environment – its atmosphere, its gravity and the choreography of the crowd – transform in powerful ways, continually challenging your perception.” - Universal Everything on Emergence. Emergence will be presented at Sundance Festival 2019, which runs from 24 January to 3 February 2019 at the Ray Theatre in Utah. The work is part of the festival’s New Frontier program which showcases independent and experimental works incorporating new media. Emergence can also be seen at Borusan Contemporary in Istanbul as part of Universal Everything’s solo exhibition Fluid Bodies. Curated by Conrad Bodman, Fluid Bodies focuses on Universal Everything’s exploration of the human condition - the links between body, behaviour and identity, and human relationships with machines - through digital media. The exhibition runs until 17 February. Sundance Festival 2019 - 24 January - 3 February 2019 at the Ray Theatre, 1768 Park Ave., Park City, Utah, US. Fluid Bodies - until 17 February 2019, Borusan Contemporary, Baltalimanı Hisar Cad. Perili Köşk No:5 34470, Rumelihisarı / Sarıyer, İstanbul, TR.